http://www.hankookilbo.com/News/Npath/201902071727334068 URL을 길게 누르면 복사할 수 있습니다. The Moon Jae-in administration is being slammed for a costly construction project aimed at lifting the economies of the underdeveloped regions. 낙후된 지역 경제를 살리겠다며 문재인 정부가 추진하는 대규모 건설 사업에 대한 비판이 제기되고 있다. During a Cabinet meeting Tuesday presided over by Prime Minister Lee Nak-yon, the government approved a five-year plan for balanced regional development, including 23 projects worth around 24.1 trillion won ($21.5 billion) that will be exempt from feasibility studies. The government will spend 175 trillion won over the next five years on various projects in areas outside Seoul and the capital region to boost provincial economies that have long suffered from a lack of growth and jobs. 이낙연 국무총리 주재로 열린 국무회의에서 정부는 화요일 약 23조원 규모의 예비 타당성 조사 면제 대상 사업 23개 등을 확정했다. 정부는 향후 5년간 175조원을 투입, 서울과 수도권 외 지역에 다양한 사업을 전개해 수년간 저성장 및 취업난으로 고전해 온 지방 경제를 일으켜 보겠다는 계획이다. The announcement has triggered heavy criticism from opposition parties and civic groups. The main opposition Liberty Korea Party called it a scheme to gather public support ahead of the general election and said it will end up burdening taxpayers. 이번 발표는 야당과 시민단체로부터 많은 비판을 받았다. 제1야당인 자유한국당은 여당이 총선을 앞두고 지지율을 끌어올리기 위한 것에 불과하며 국민에게 세금 폭탄을 안길 것이라고 주장했다. Moon has been particularly critical of the past conservative administration of Lee Myung-bak which fixated on large-scale construction such as the Four Rivers Restoration Project, which is now considered one of the biggest failures of his government. The project was also pursued hastily without a proper feasibility study and Lee is still blamed heavily for it. 문 대통령은 4대강 정비사업 같은 대규모 건설 사업에 집착했던 이명박 정부를 특히 비난 해 왔다. 이 사업도 제대로 된 예비 타당성 조사도 없이 추진되었고 이 전 대통령은 지금도 이로 인해 많은 비난을 받고 있다. A recent survey showed the Moon administration is swiftly catching up with the amount spent by the Lee administration on projects that were given feasibility study waivers. The Lee administration spent 60 trillion won on 88 projects from 2008 through 2012. In just three years, the Moon administration is already expected to have spent 53 trillion won on such projects. 최근 조사에 따르면 문재인 정부는 이명박 정부의 예타면제 대상 사업 규모에 거의 근접한 것으로 보인다. 이명박 정부는 총 88개 사업에 60조원을 투입했고 문재인 정부는 벌써 53조원 집행을 계획하고 있는 것으로 나타났다. 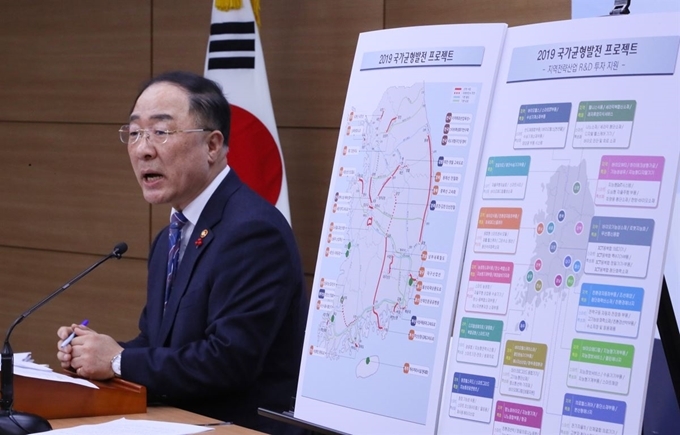 During a press conference at the Sejong Government Complex Tuesday, Hong Nam-ki, minister of economy and finance, said the projects chosen to be exempt from feasibility studies were different from Lee's project to restore the nation's four major rivers. He underlined that they were chosen because they have the potential to create synergy in improving balanced national development and regional economies and that local governments had placed priority on them. 홍남기 부총리 겸 기획재정부 장관은 화요일 세종정부청사 기자회견에서 이번에 선정된 사업들은 이명박 정부 시절 4대강 살리기 사업과는 다르다고 주장했다. 홍 부총리는 선정된 사업들이 국토 균형 발전과 지방 경제 살리기에 서로 시너지 효과를 줄 수 있고 지방자치단체들의 숙원사업들이었음을 강조했다. The minister also emphasized that the plan included projects related to the environment, health and transportation that are related closely to the peoples' livelihoods. 그는 또 환경, 보건, 교통 등 민생과 밀접한 연관이 있는 사업들이 대거 포함되었음을 부각시키기도 했다. 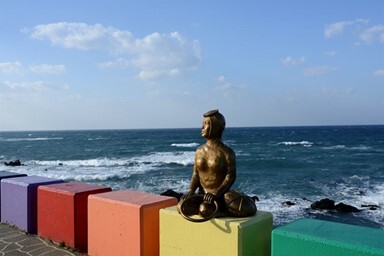 The key projects include the construction of a railway linking Gimcheon and Geoje Island and an international airport in the Saemangeum region. Hong also defied concerns that the projects will place a big burden on fiscal management. 핵심 사업을 보면 김천과 거제도를 잇는 철도와 새만금 국제공항건설 등이다. 홍 부총리는 국가 재정에 큰 부담이 될 것이라는 지적에도 반론을 제기했다. Despite efforts to assuage public criticism, many people are not convinced. 국민이 걱정하는 바를 불식시키고자 했지만 설득력이 떨어진다는 평가다. It is important for the government to implement policies for balanced development of the country. But it needs to listen to the mounting criticisms against the plan. 정부가 지역 균형 발전을 추진을 하는 것이 중요하기는 하지만 이에 대한 비판도 새겨 들어야 한다. Proper feasibility studies are necessary to block the ruthless investment plans pursued by regional governments and to prevent excessive tax waste. 지방 정부가 무절제하게 추진하는 각종 투자를 제어하고 세금 낭비를 막기 위해서는 면밀한 예비 타당성 조사가 반드시 필요하다. The government should carefully examine whether all these projects are really useful and will have the desired economic effect. Otherwise, the Moon administration will continue to be criticized for populist projects that will only increase the burden on taxpayers in the long run. 정부는 이 사업들이 다 필요한 것인지, 그리고 예상대로 경제적 효과를 가져올 수 있을 것인지 제대로 조사해야 한다. 그렇지 않고서는 포퓰리즘에 기댄 사업을 졸속 추진해 장기적으로 국민 세금 부담만 가중시켰다는 비판을 면치 못할 것이다.